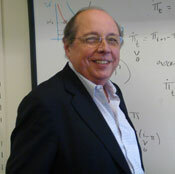 Guillermo Calvo is Professor of Economics, International and Public Affairs, and Director of the MPA in Economic Policy Management (MPA-EPM) at Columbia University since January 2007. He is a Research Associate at the National Bureau of Economic Research (NBER). He is the former Chief Economist of the Inter-American Development Bank (2001-2006), President of the Latin American and Caribbean Economic Association, LACEA, 2000-2001, and President of the International Economic Association, IEA, 2005-2008. He graduated with a Ph.D. from Yale in 1974. He was professor of economics at Columbia University (1973-1986), the University of Pennsylvania (1986-1989), and Distinguished University Professor at the University of Maryland (1993-2006). He was Senior Advisor in the Research Department of the IMF (1988-1993), and afterwards advised several governments in Latin America and Eastern Europe. His main field of expertise is macroeconomics of Emerging Market and Transition Economies. His recent work has dealt extensively with capital flows and balance-of-payments crises in Emerging Market Economies. He has published several books and more than 100 articles in leading economic journals. His latest book “Emerging Capital Markets in Turmoil: Bad Luck or Bad Policy?” was published in 2005 by MIT Press, Cambridge, MA.